Also called the Florence of the south, Lecce is known for its baroque architecture with more than 40 churches and at least as many noble palazzi built or renovated between 17th and 18th century. The streets are always alive with a very friendly atmosphere. Don’t miss the Pasticciotto (typical cake of Lecce) at Pasticceria Alvino in piazza Sant’Oronzo, and the ice coffee with almond syrup! Get lost in Ostuni, the beautiful maze-like white city, and fall in love with the stunning views. Wandering through the old alleys of its historic center inside its ancient walls you can find traditional craftsmanship shops, cozy cafes and aperitivo spots, and lovely restaurants to experience a perfect Apulian dinner before a drink in one of the trendy bars where you can enjoy the lively Italian nightlife in a very international environment. 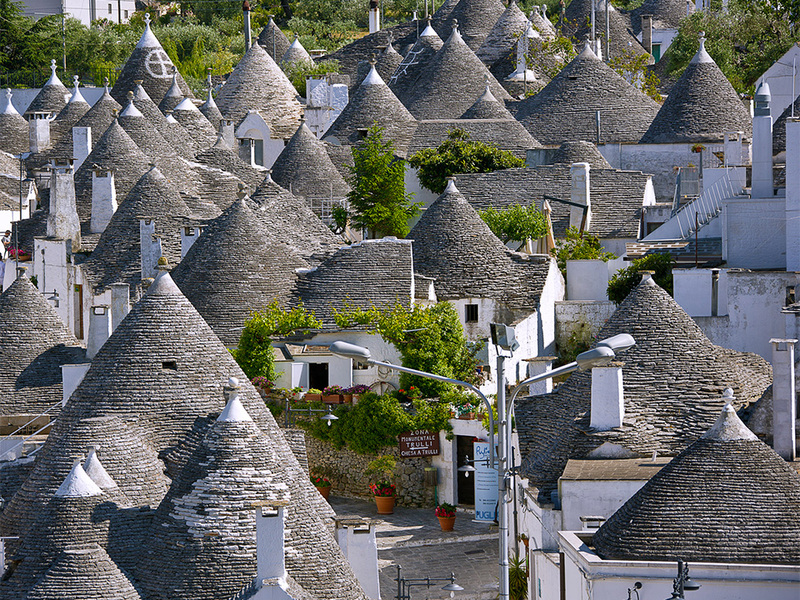 Alberobello is a fairytale UNESCO World Heritage town made of 1500 Trulli (typical Apulian conical stone huts). It is considered a unique and enchanting place and it is definitely worth a visit. The region’s star attraction is the food. As might be expected, seafood dishes predominate, with squid a favourite ingredient, but there’s also a host of local specialties. The inland town of Altamura produces bread prized all over Italy. It’s baked in wooden ovens to a recipe unchanged since the Middle Ages. 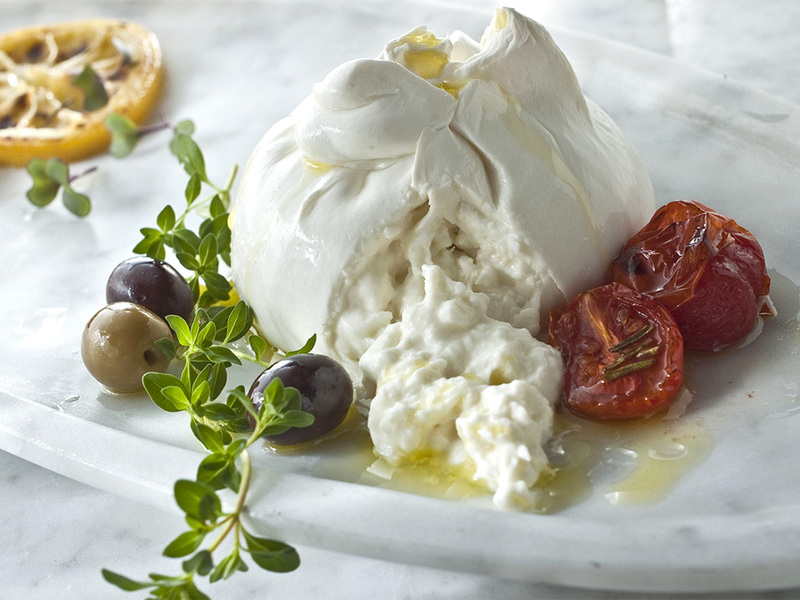 Gioia del Colle is the place to go for mozzarella and burrata cheese; while in Murgia, cardoncello mushrooms and wild onions abound. And wherever you are, you can order a glass of red Primitivo or Negramaro wine, of course. Nature lovers will be amazed by Puglia caves and nature reserves, where to find rare species of plants and animals. If you prefer a more active holiday, you can pick your favorite sport and enjoy it in the great outdoors. You can go trekking or horseback riding; you could try surfing or go snorkeling and discover extraordinary sights under the sea. And if you are looking for a break and simply relax, let yourself be pampered by specialized personnel at the many wellbeing centers, or re-boost your energies at a spa. From Santa Cesarea to Margherita di Savoia, thermal baths have always been a panacea to soothe body and soul. The southernmost area of Puglia, Salento, is defined by stony olive groves that extend between dry-stone walls bordered with oleander. It has a strong identity with its own cuisine, traditions and music, influenced by its Greek past. Along with some of Italy’s best beaches such as Porto Cesareo with the Punta Prosciutto dunes, Pescoluse beach (also called Maldives of Salento) and Torre Lapillo beach there are some fascinating towns to explore such as Otranto, Specchia and Presicce (awarded as 3 of the most beautiful Italian villages). Polignano a Mare is one of Puglia’s most picturesque seaside towns, and one of the most important ancient settlements in Puglia. For a once in a lifetime experience, visit Grotta Palazzese, a luxury restaurant with a view over a magnificent blue-green sea, carved out of magnificent limestone rocks that lies in an unparalleled location. Valle d’Itria, also called “Trulli valley”, is an extended valley with a unique fairytale landscape composed by cylindrical peasant houses with beehive roofs known as Trulli. Step back in time and experience living in a traditional trullo house with a private pool set in the peaceful Puglia countryside. 1. Pescoluse: celebrated as the Maldives of Puglia, the fine white sands and idyllic azure waters are positively heavenly. With a length of over 5km it’s perfect for long relaxing walks at sunrise or sunset, or for jogging along the Ionian seashore. 2. 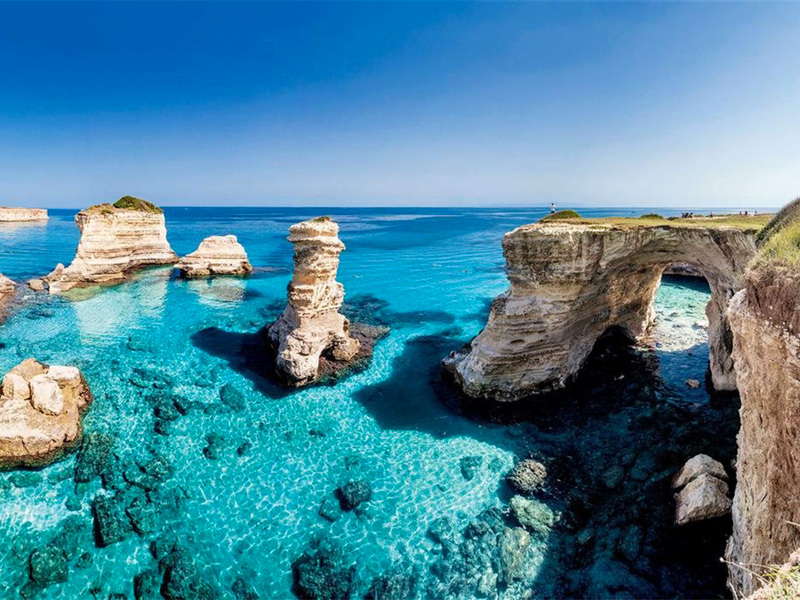 Torre dell’Orso: with its powdery white sands, crystal clear water and two towering sea cliffs known as the Due Sorelle (two sisters), the beach is one of the region’s most dramatic landscapes. 3. 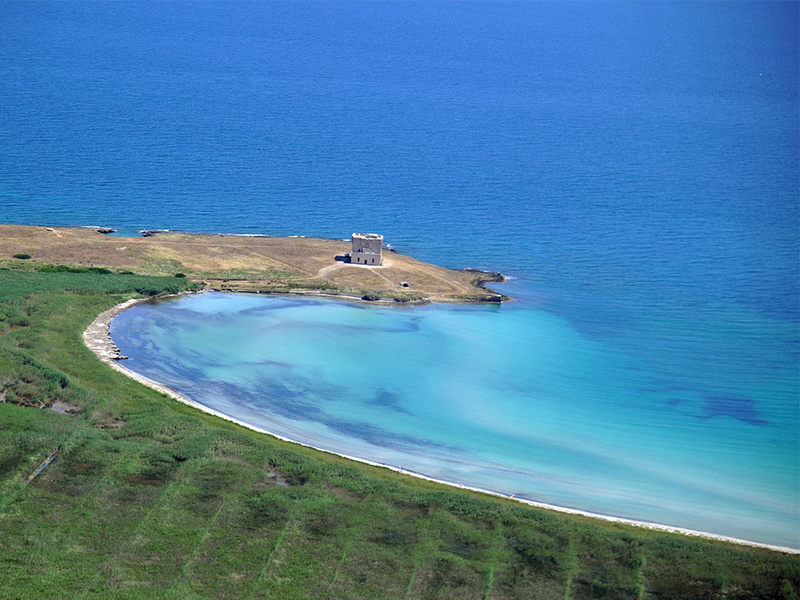 Torre Guaceto: as a protected marine area and a nature reserve, it is a haven for natural beauty. The long stretch of coastline means there is always a private patch of sand to claim, while the colourful coral reefs and sea grass beckon snorkelers and divers alike. 4. Polignano a Mare: it charms beachgoers with its impressive rocky coast interspersed by some spots of sandy beaches. 5. Margherita di Savoia: it is ideal for holidaymakers seeking utter relaxation. The famous salt pans are a must see highlight while the calm waters make it perfect for a luxury family vacation in Puglia. Puglia has a truly Mediterranean climate with mild winters and hot summers. An average of 300 sunny days per year makes summer (May – September) the most popular time to visit Puglia. The off-season is October to April, when the water becomes too cold to swim, and the days are chilly and rainy. But the countryside is still rich with cultural activities and outdoor pursuits like horseback riding and biking.